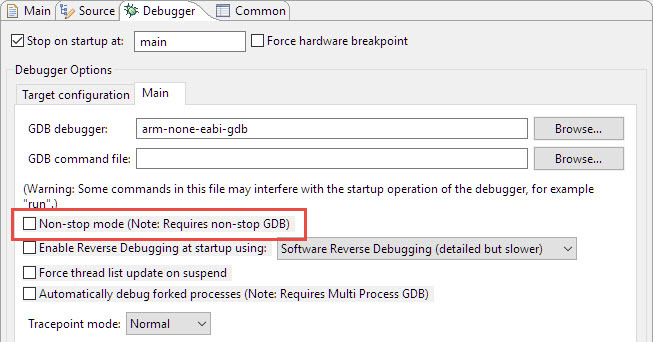 This article describes tips and tricks to get FreeRTOS thread aware debugging in Eclipse, organized by debug probe connection/vendor. For thread awareness, the debugger needs to know some well-known symbols of the RTOS. 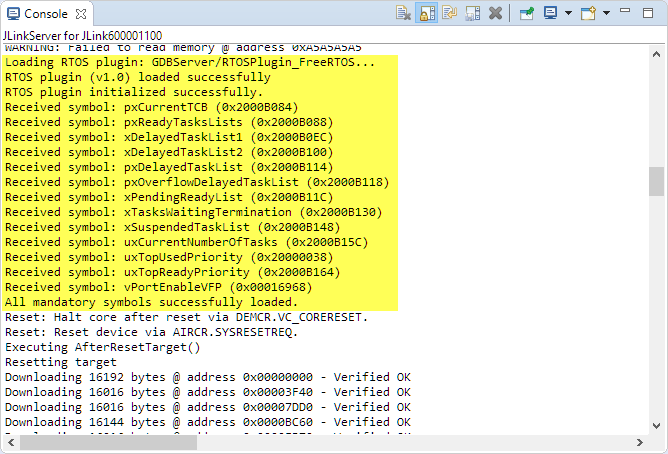 So beside of checking if the thread awareness is turned on, have a look about the debug output. If the symbols are not present, it might be because of linker optimizations or not turning on FreeRTOS features. 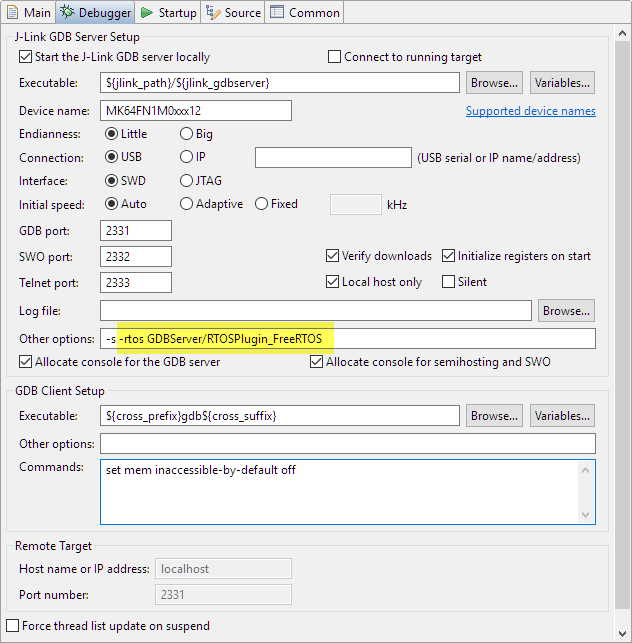 The P&E debug connection has no special setting for FreeRTOS thread aware debugging and does it automatically, so there is no option to turn it on or off. Kernel thread information now available. Successfully initialized kernel symbols. FreeRTOS analysis enabled. 💡 I recommend to switch the debug level back to the default of 2, as it produces a lot of output. 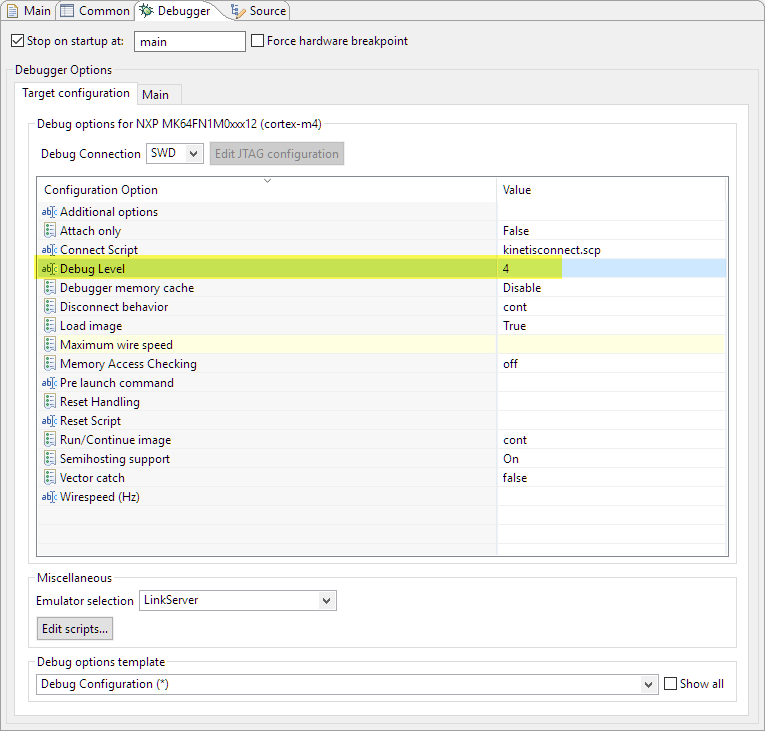 Read the MCUXpresso_IDE_FreeRTOS_Debug_Guide.pdf inside the MCUXpresso IDE installation folder. 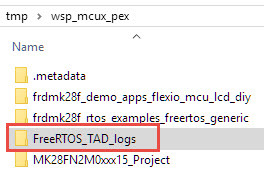 Make sure you have “freertos_tasks_c_additions.h” present in your project (You can find a version of it in the NXP SDKs or here on GitHub). 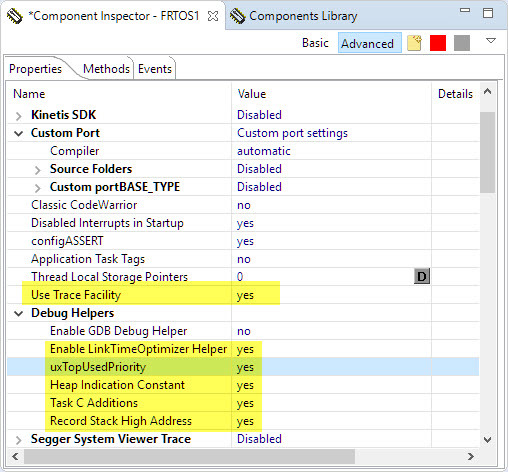 For OpenOCD, see FreeRTOS Thread Debugging with Eclipse and OpenOCD. If everything fails, a good idea is to increase the task stack size and heap size, as some strange errors can happen if tasks overwrite variables of the kernel. There is an stack overflow hook in FreeRTOS, but this will not be able to catch every overflow. (c) 2016 NXP Semiconductors, Inc.
11:16:24.795 INFO: [TadModel] DSF session ID 4 has started. 11:17:29.695 INFO: [Benchmark] Loading data for "Task List" has started. 11:17:30.309 INFO: [FreeRTOS] FreeRTOS macro "configGENERATE_RUN_TIME_STATS" is disabled. 11:17:31.288 ERROR: [MemoryReader] Could not get memory block! Invalid address "0x1ffc0008" and/or "0x13ff8" length of a block! 11:17:32.290 INFO: [FreeRTOS] FreeRTOS macro "configUSE_TRACE_FACILITY" is disabled. 11:17:33.291 ERROR: [TaskFactory] Cannot read information from "xDelayedTaskList1". 11:17:33.999 INFO: [Benchmark] Loading data for "Task List" took 4304 ms.
11:18:42.676 INFO: [TadModel] DSF session ID 4 has ended. In the above case, the a task had been created with 80kByte stack and this caused a problem with that version of the NXP Task aware plugin. Setting the heap to a smaller value below 64kByte worked as a workaround. 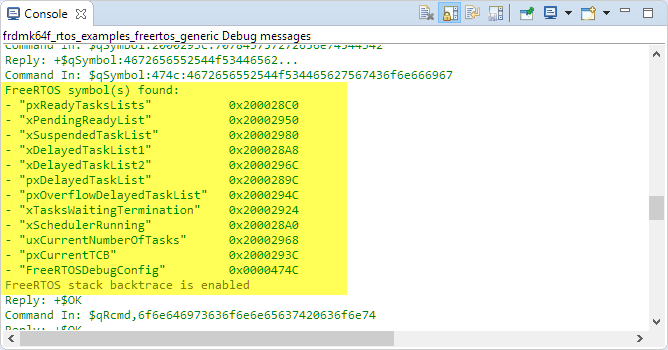 FreeRTOS thread aware debugging depends on debug connection used. 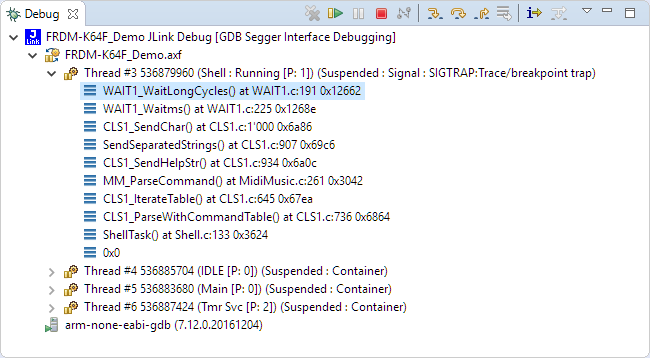 In most cases it might fail because some symbols are not present in the application to help the debugger to show the threads. I hope that this article helps you to find and possibly fix any issues. 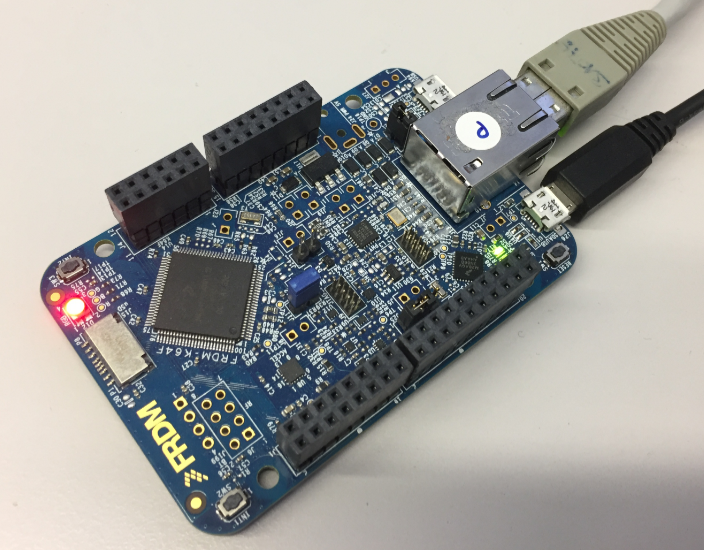 This entry was posted in ARM, Building, CodeWarrior, CPU's, Debugging, Eclipse, Embedded, FreeRTOS, Freescale, gcc, KDS, Kinetis, LPC, MCUXpresso, MCUXpresso IDE, NXP, SDK, Tips & Tricks and tagged ARM, arm gcc, Debugging, Eclipse, FreeRTOS, Freescale, gnu gcc, Kinetis, Kinetis Design Studio, LinkServer, MCUXpresso IDE, OpenOCD, OpenSDA, OSBDM/OSJTAG, P&E, Segger, software, technology, Tips&Tricks by Erich Styger. Bookmark the permalink. Any suggestions for the following error from the segger gdb output? ERROR: Mandatory symbol pxReadyTasksLists not found. 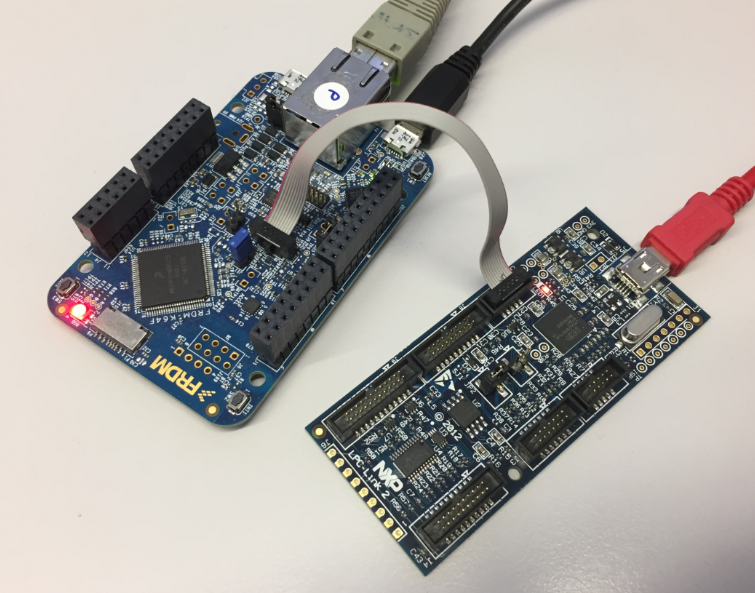 Using FreeRTOS9.0 and the latest segger tools on a K20F. It all works fine if I turn of LTO, but I’d rather not. Applications works fine in either case. It means that the linker somehow has removed pxReadyTasksLists. 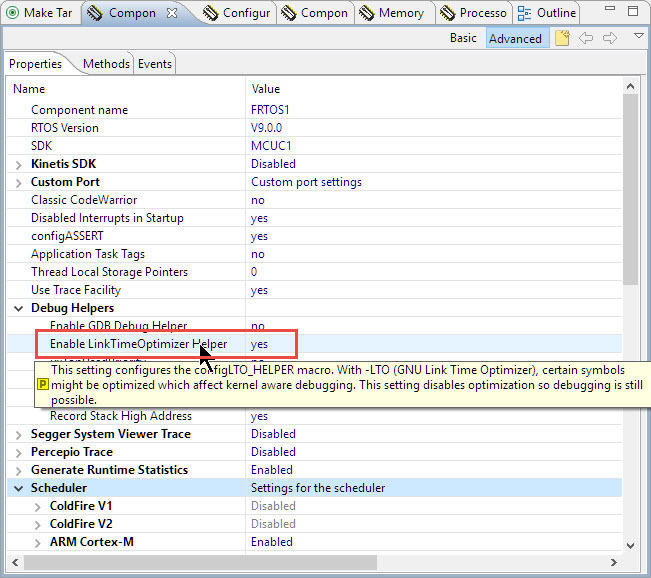 Are you using the McuOnEclipse FreeRTOS port (as this one has several measures to prevent such linker optimizations)? We are actually using OPENrtos (FREErtos, no license restrictions but same code) unmodified. What is weird is we hav another project using the same code/FREErtosconfig and it works fine in either case. I’m investigating what can be done, so stay tuned…. Basically I have marked some needed variables as non-static, otherwise the linker renames the variables and Segger cannot find them. 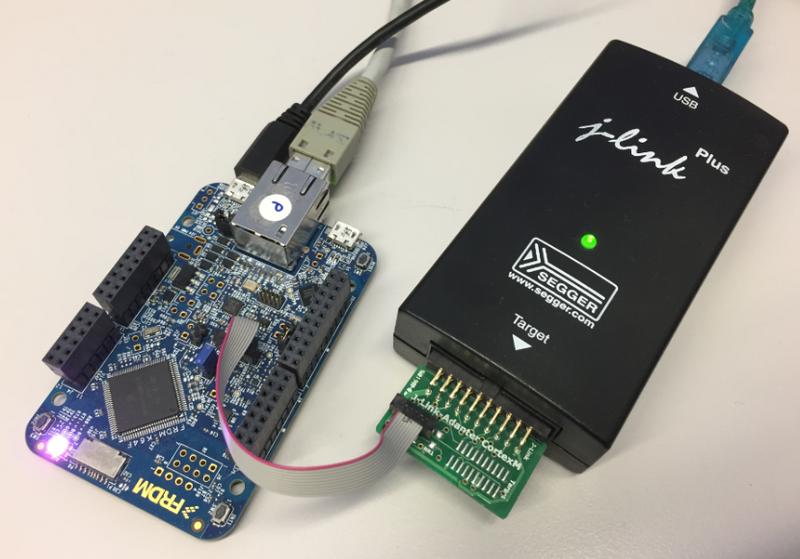 Hi Erich – Perhaps also worth mentioning..
I’m using my J-Link with Segger’s FreeRTOS aware debugging to debug an issue with an KDS project for a KL16. My project only has two tasks (in addition to Tmr Svc and IDLE). Debugging seems to work great when I run the application from the debugger. The problem I’m having is when I try to attach the debugger to a running board to troubleshoot an issue. When I do this, only one of my tasks shows up in the Eclipse thread tree. 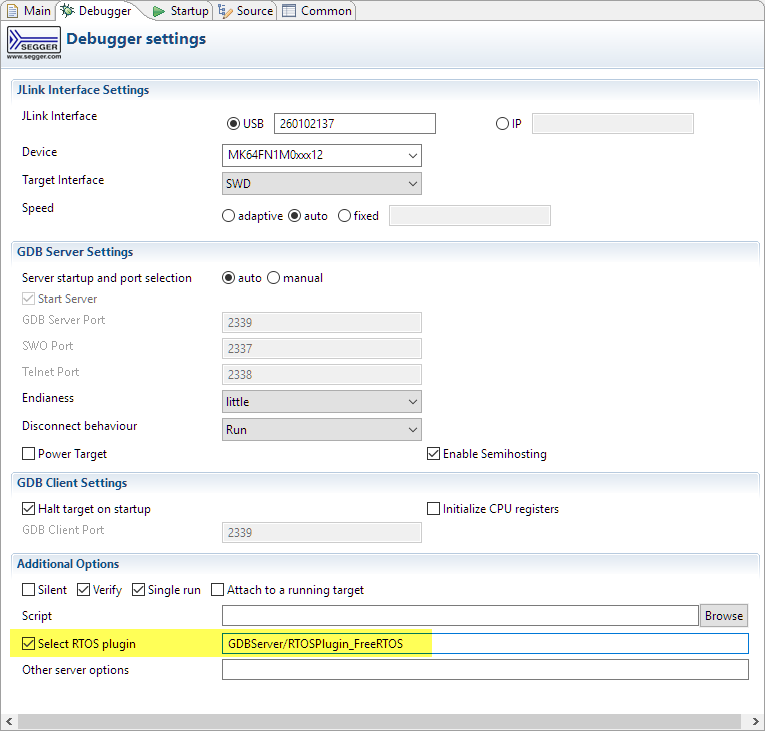 However, if I use the FreeRTOS Task List that is built into KDS, both of my tasks show up. Unfortunately, the Task List doesn’t provide any useful information about where the tasks are currently executing in the code. I’ve made sure all the defines Dave listed above are accounted for in my config. Do you have any idea why the thread tree is missing a task or know how to fix or work around this issue? It works fine on my side: I can connect/attach to a running application and then halt it, it shows me all threads with the J-Link connection. If you install the new SEGGER software, it should upgrade the version you have in KDS. Thanks for the tip, Erich! 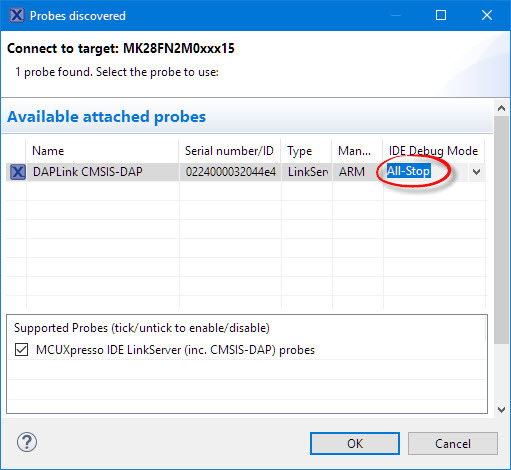 I updated the J-Link software to 6.34h and also updated the debugger firmware and it seems to have fixed the problem. thanks for confirming that this fixed your problem!